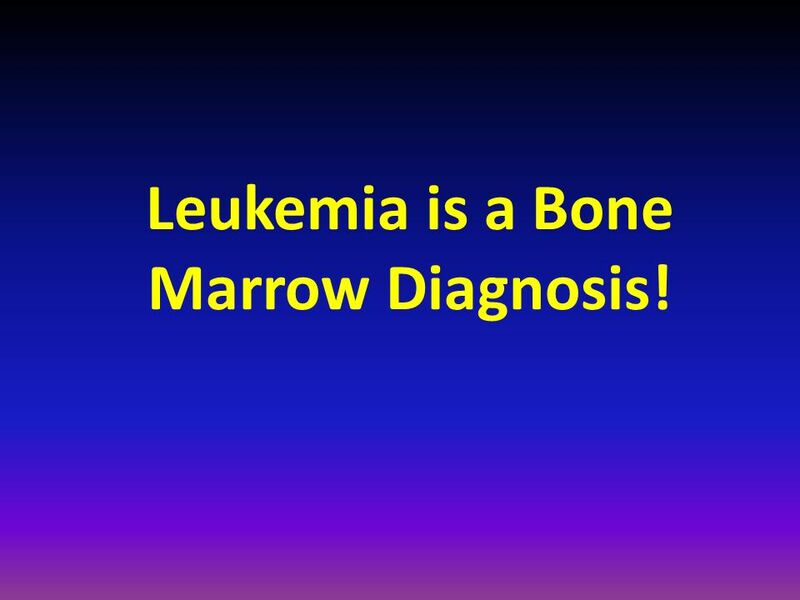 8 Leukemia is a Bone Marrow Diagnosis! 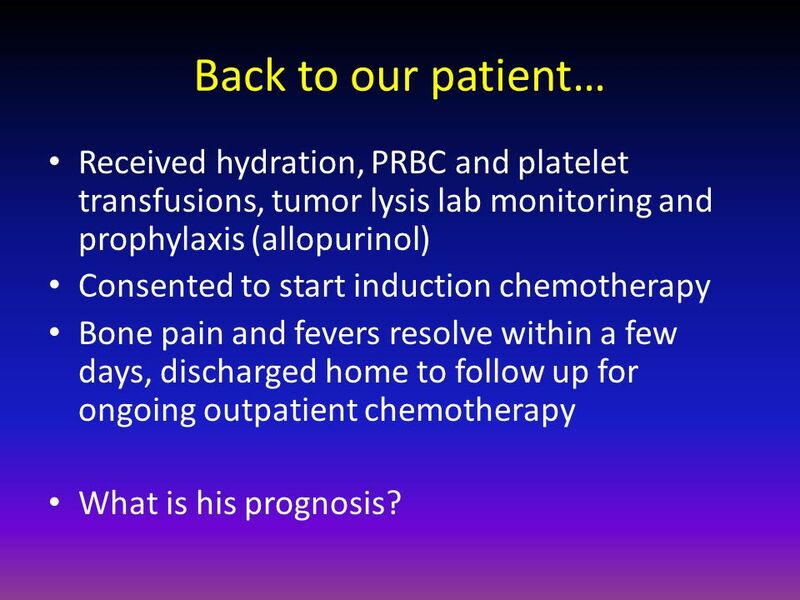 22 Back to our patient… Received hydration, PRBC and platelet transfusions, tumor lysis lab monitoring and prophylaxis (allopurinol) Consented to start induction chemotherapy Bone pain and fevers resolve within a few days, discharged home to follow up for ongoing outpatient chemotherapy What is his prognosis? 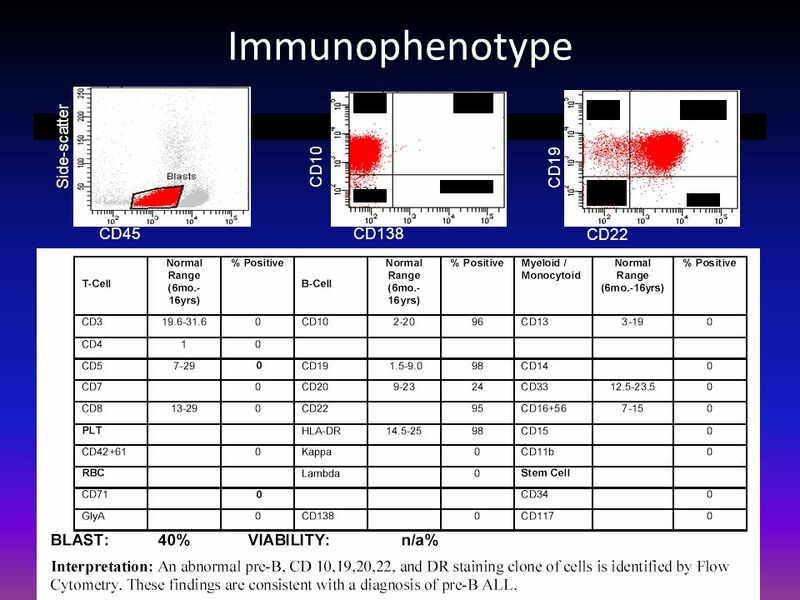 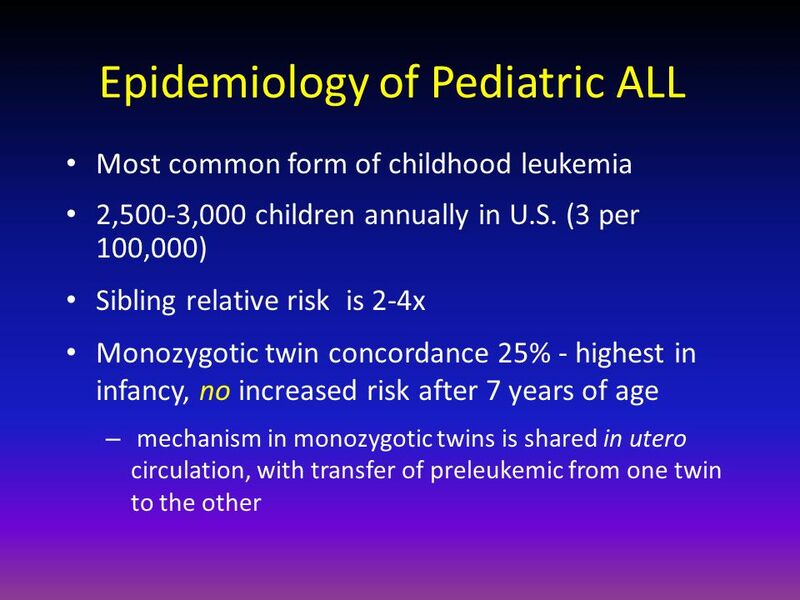 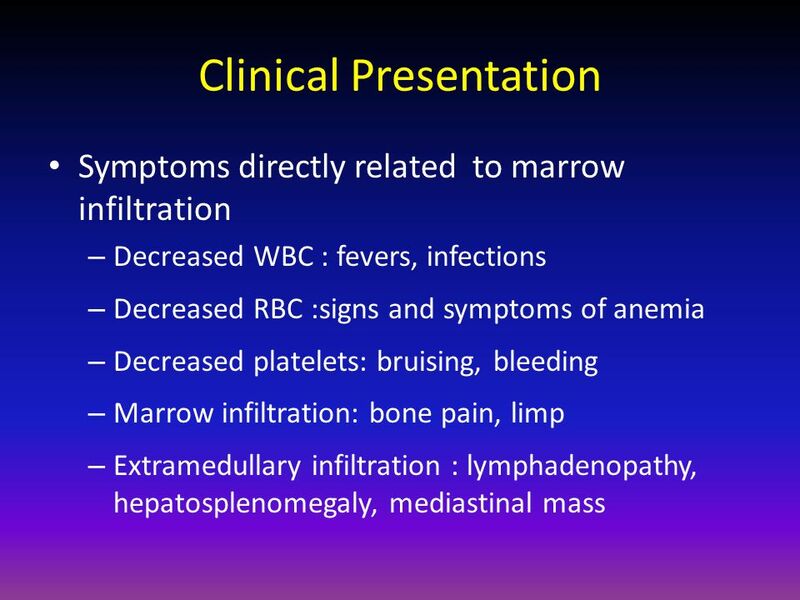 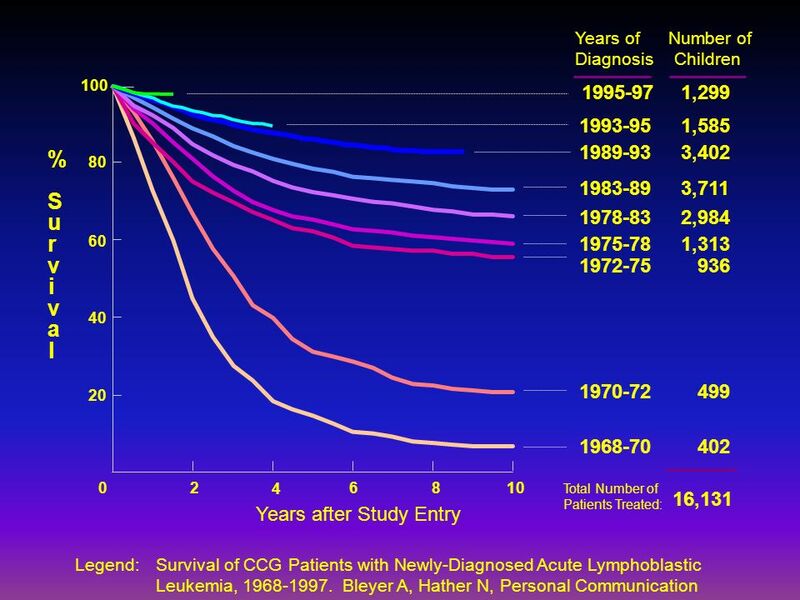 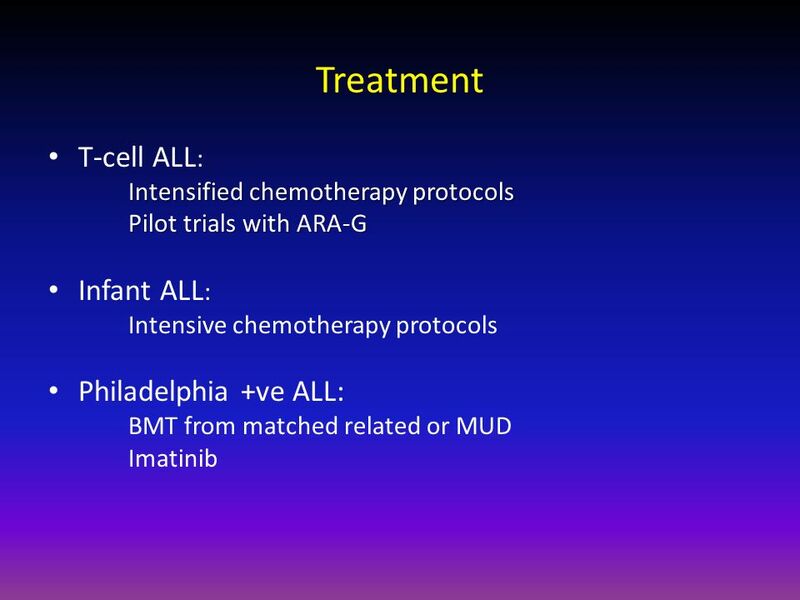 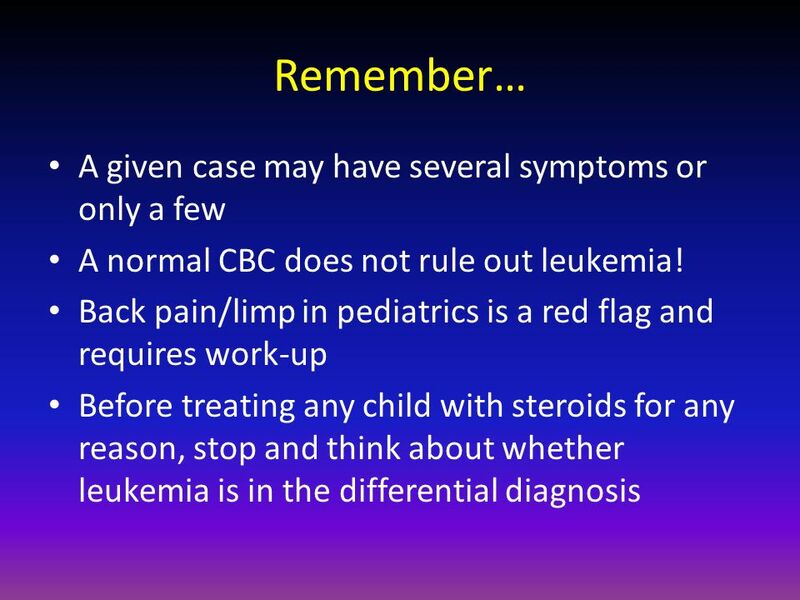 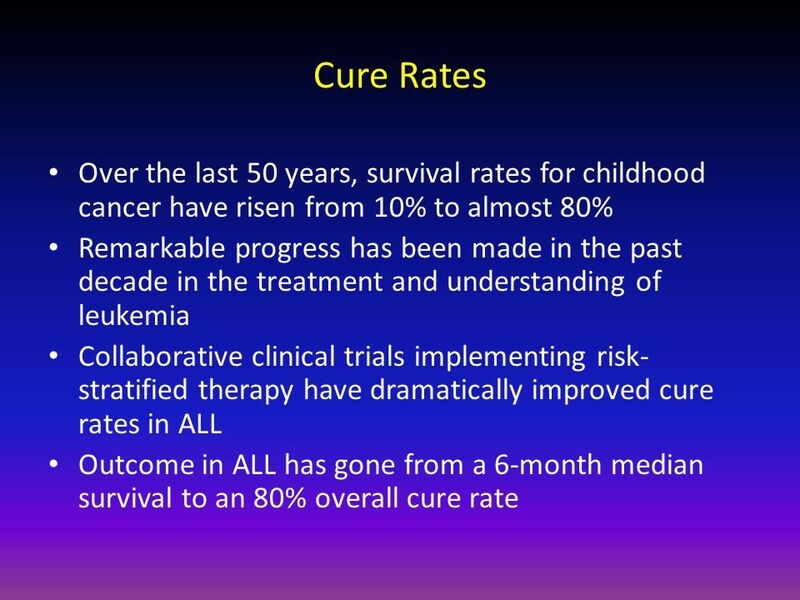 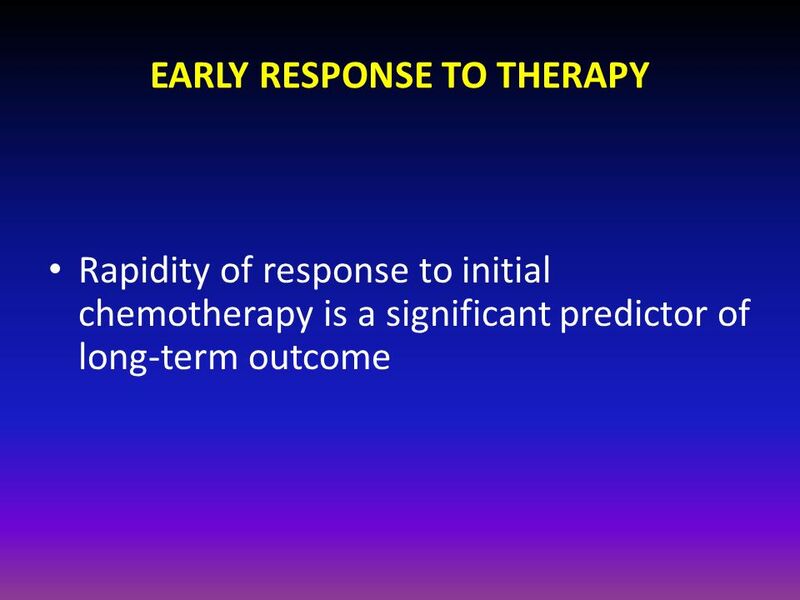 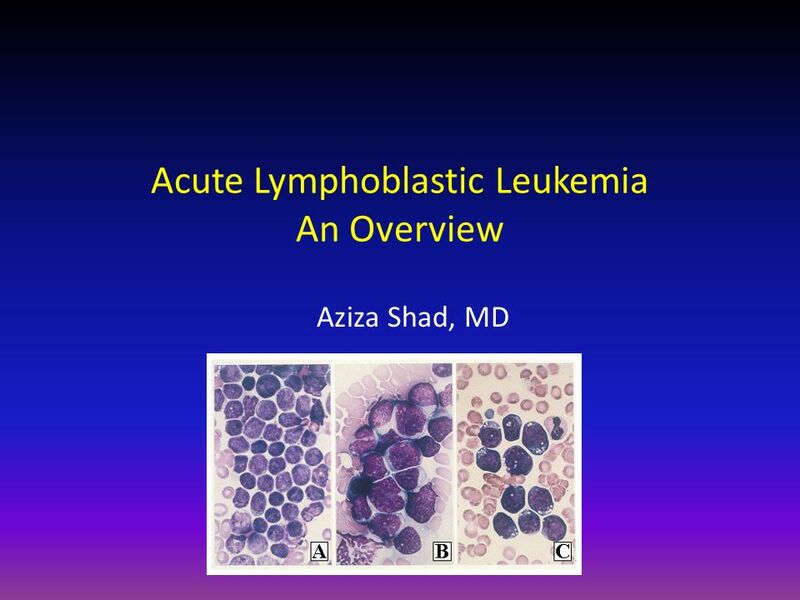 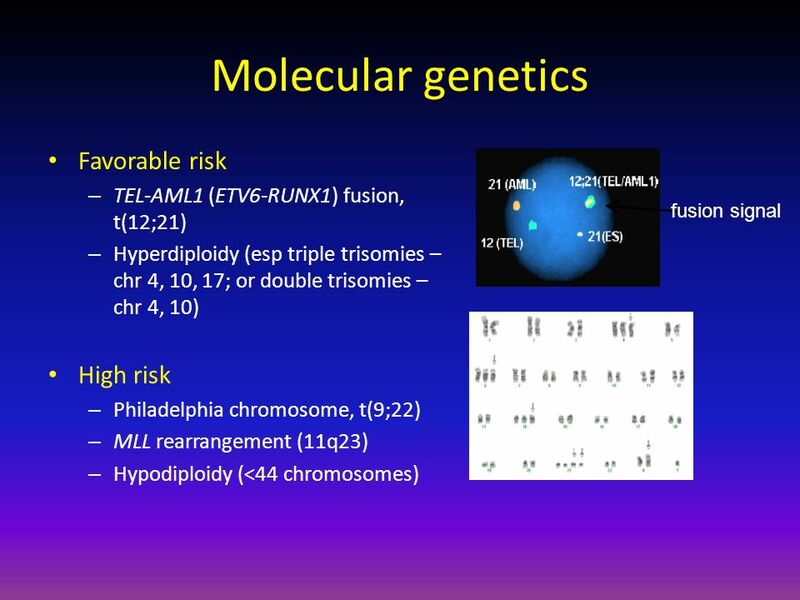 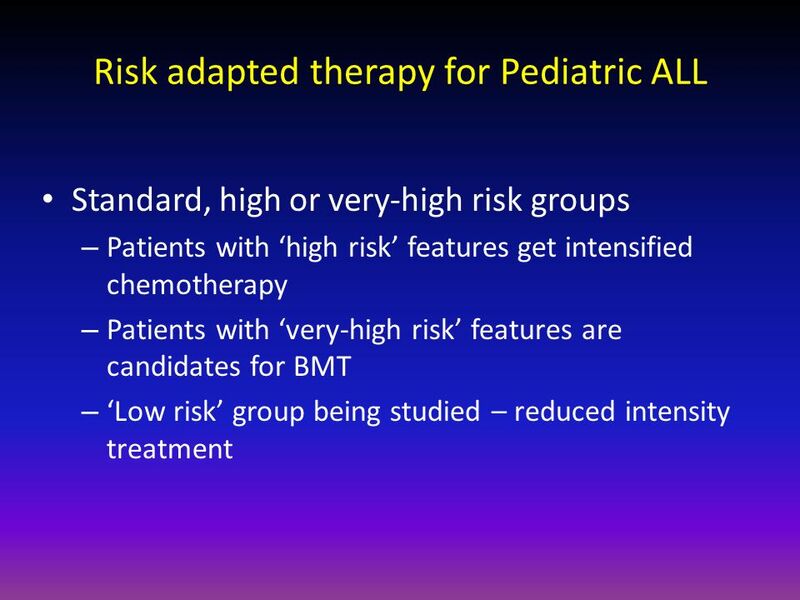 Download ppt "Acute Lymphoblastic Leukemia An Overview"
Leukemia The leukemias are the most common malignant neoplasms in childhood: 41% of all malignancies that occur in children less than 15 yrs. 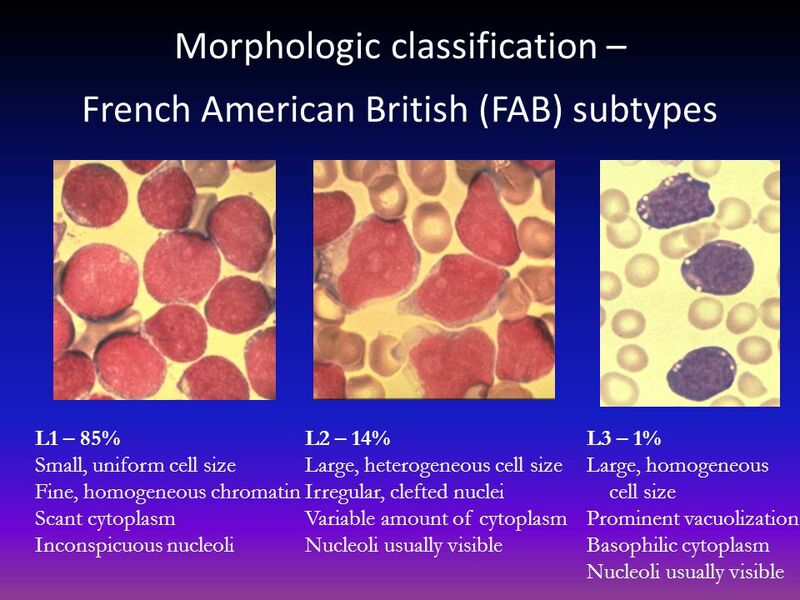 77% - Acute. 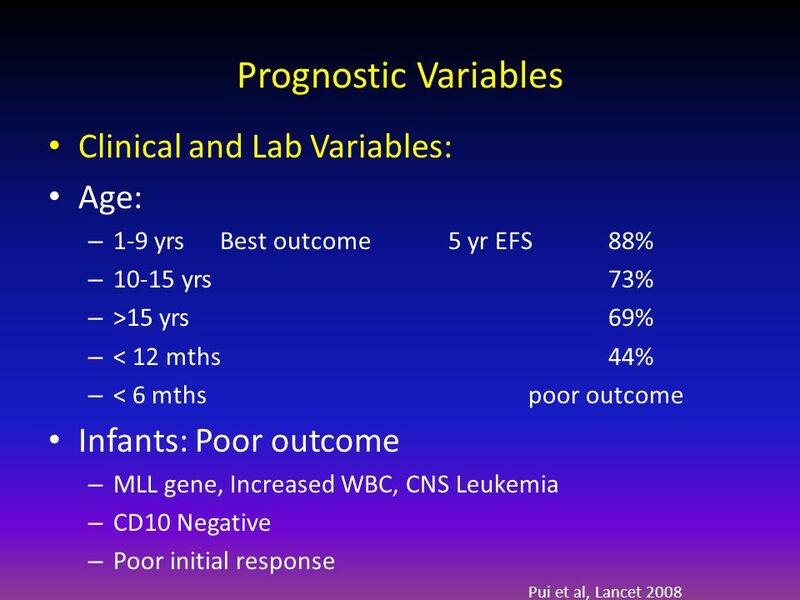 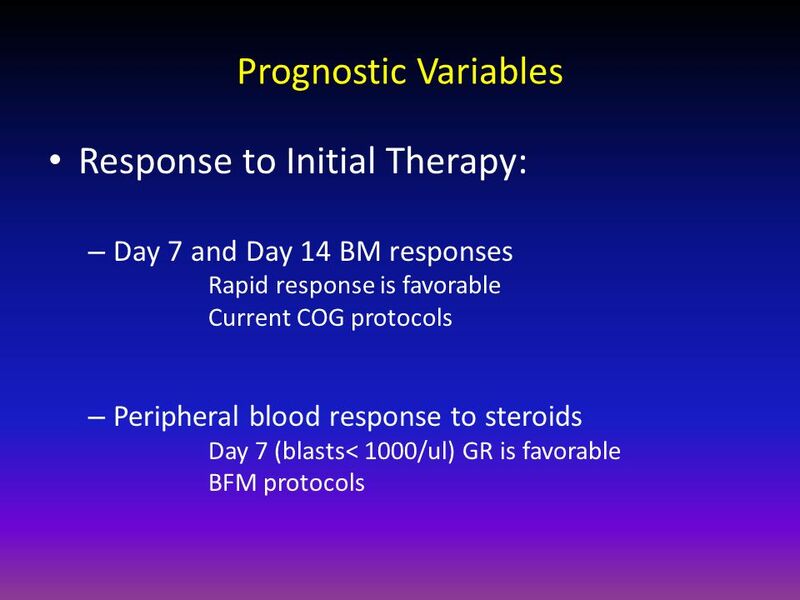 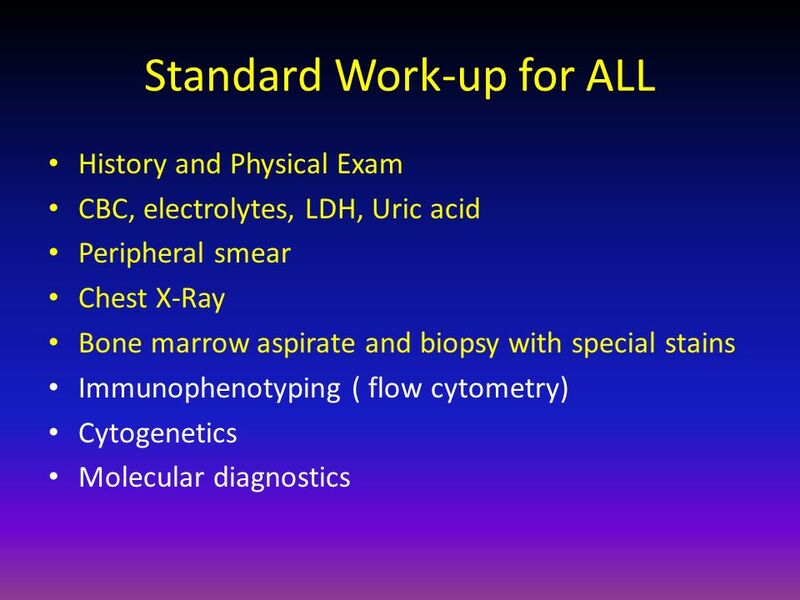 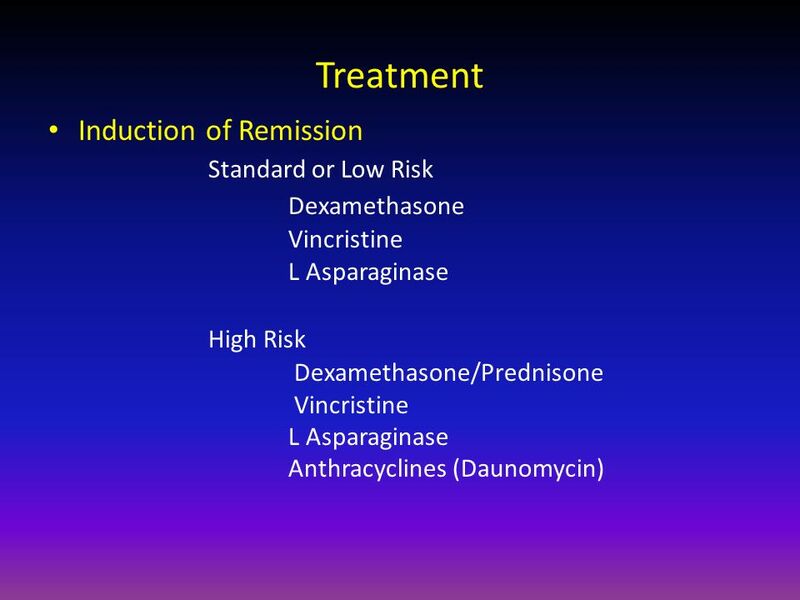 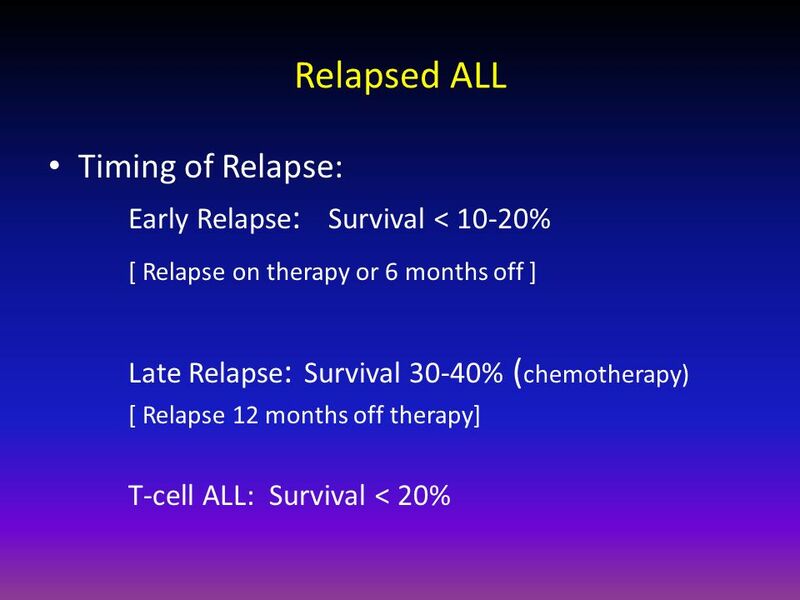 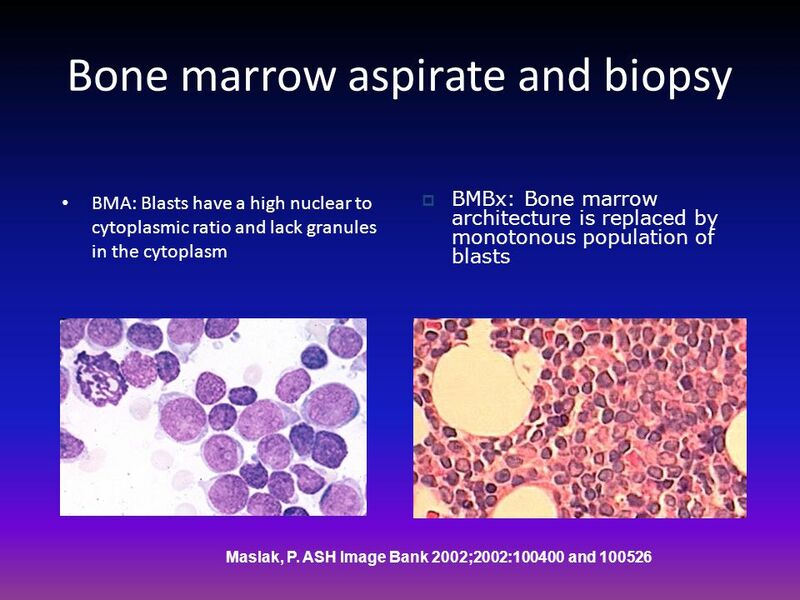 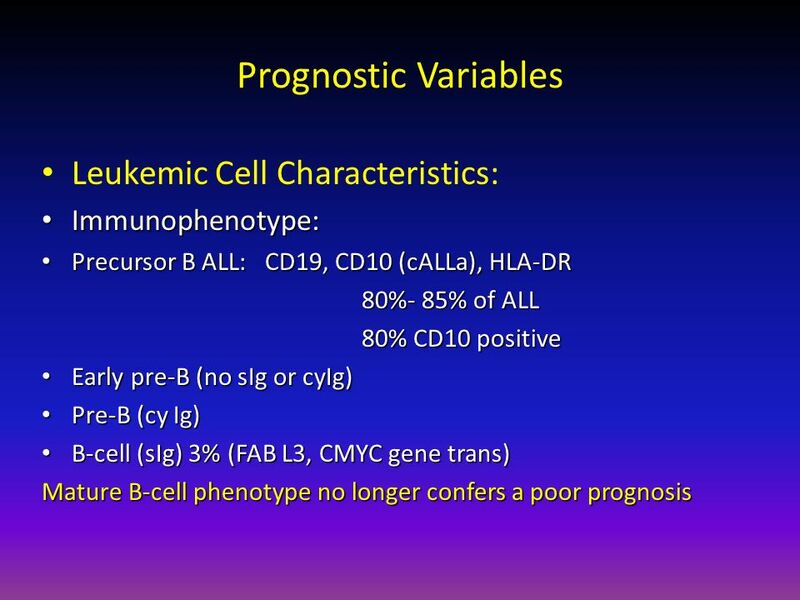 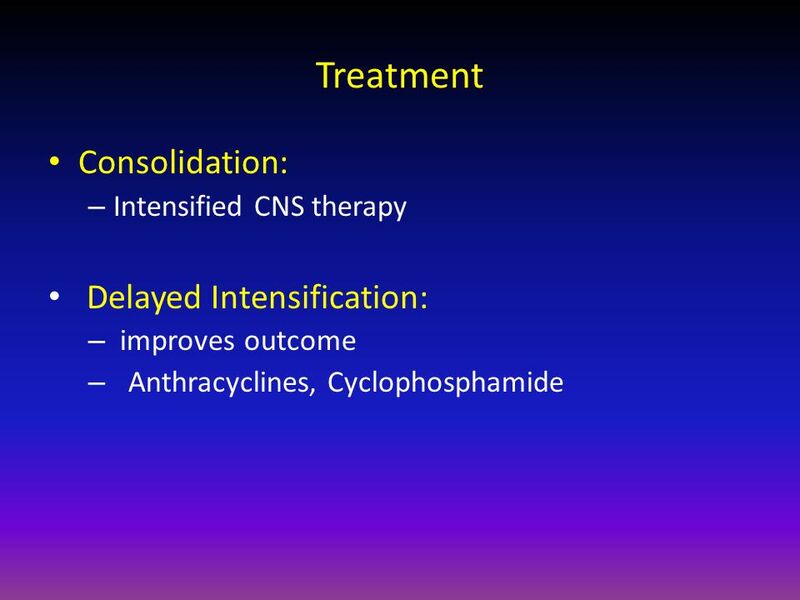 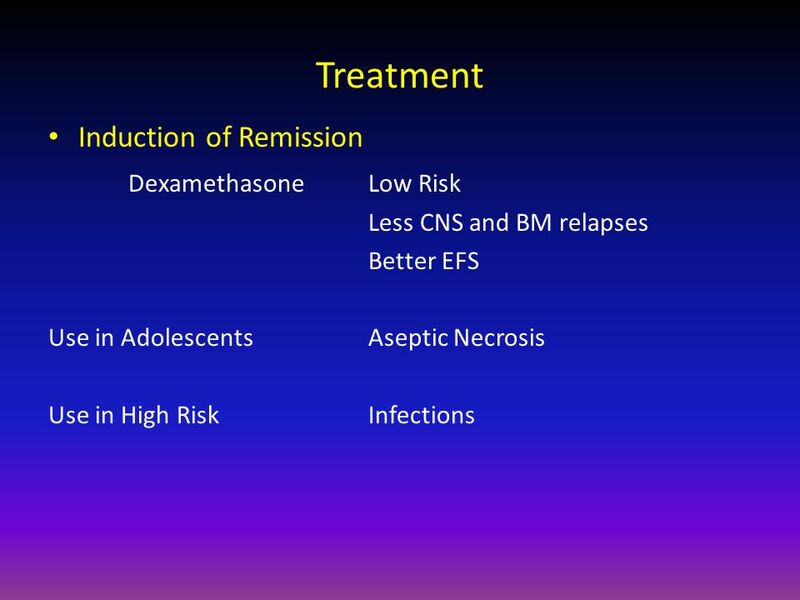 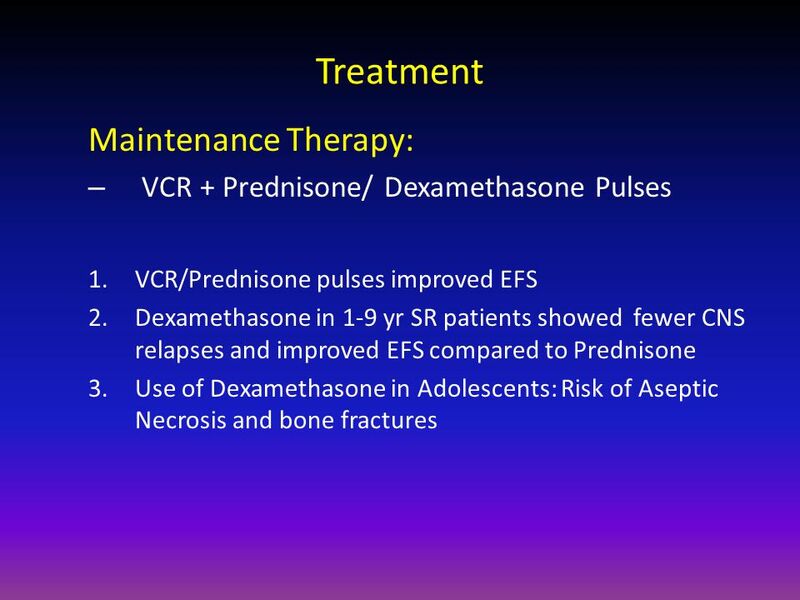 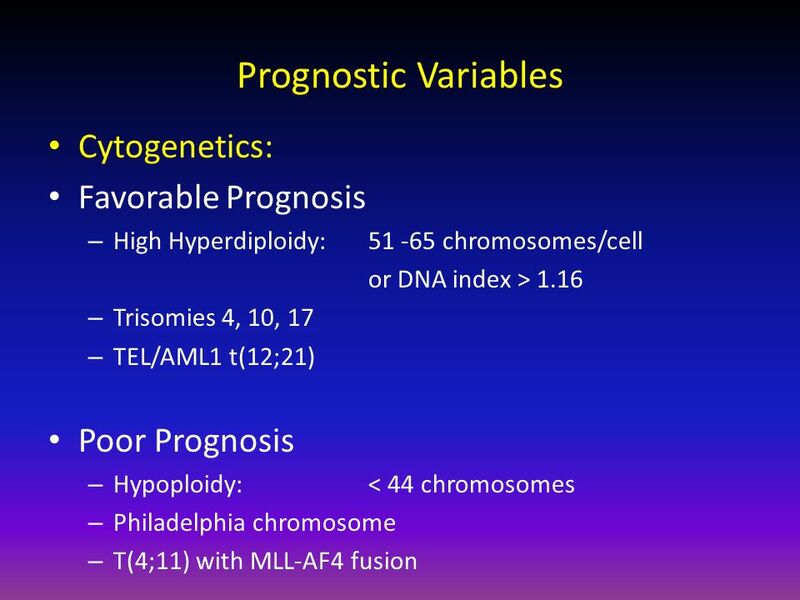 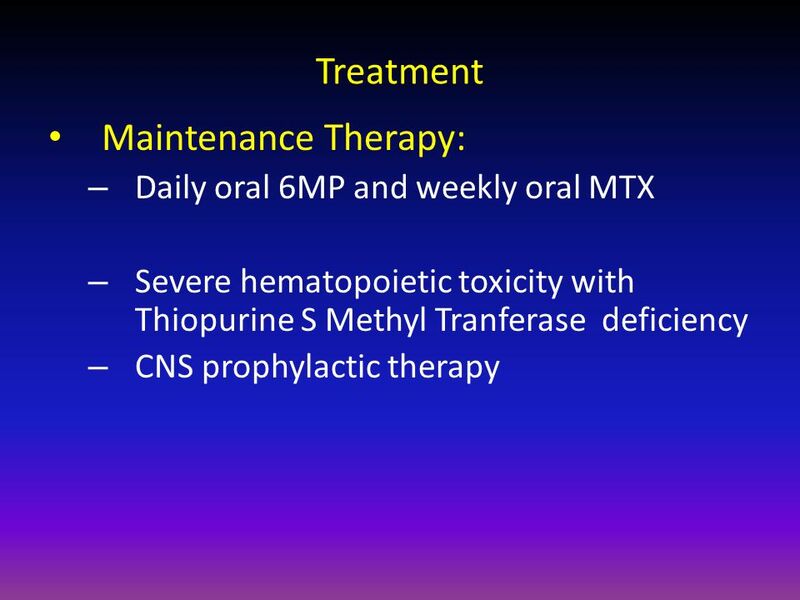 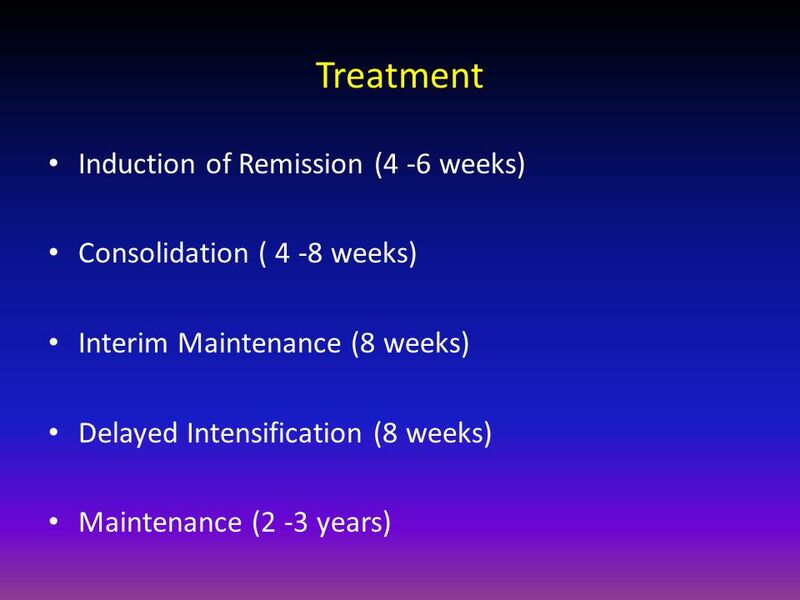 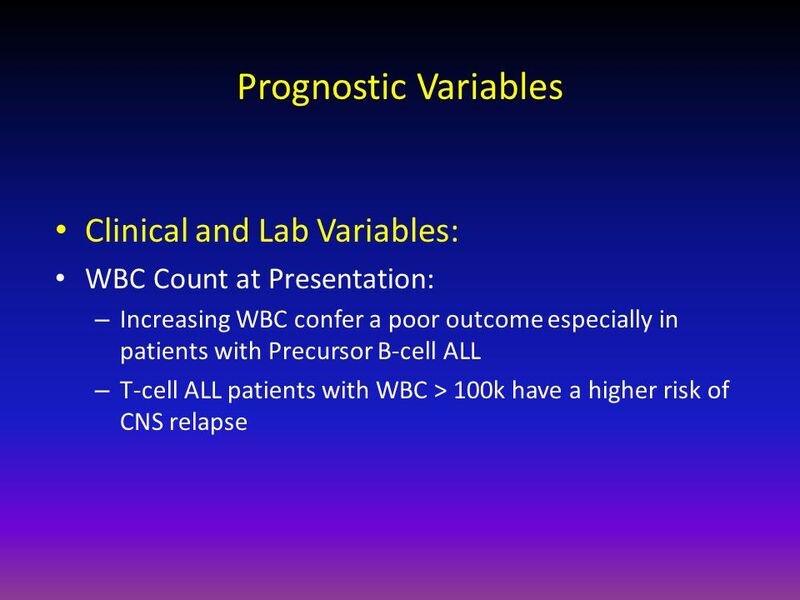 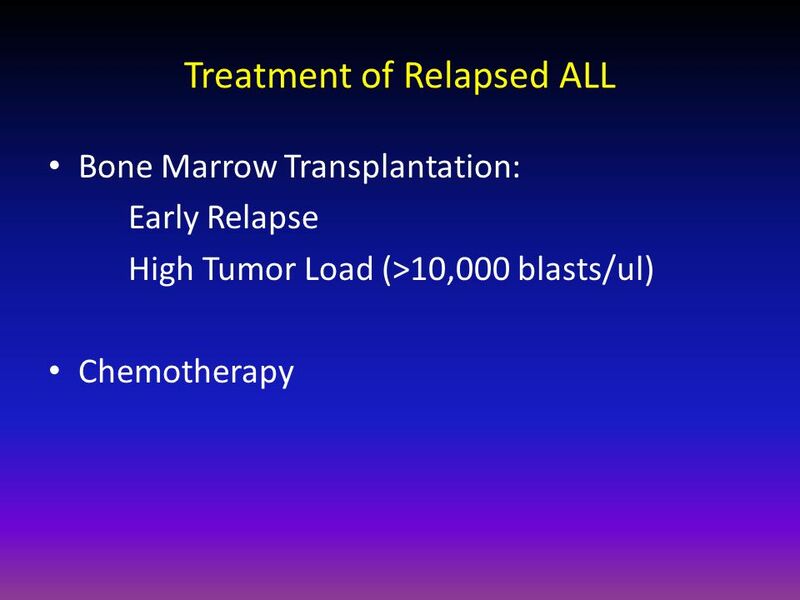 Minimal Residual Disease in Hematologic Neoplasms Lloyd M. Stoolman, M.D. 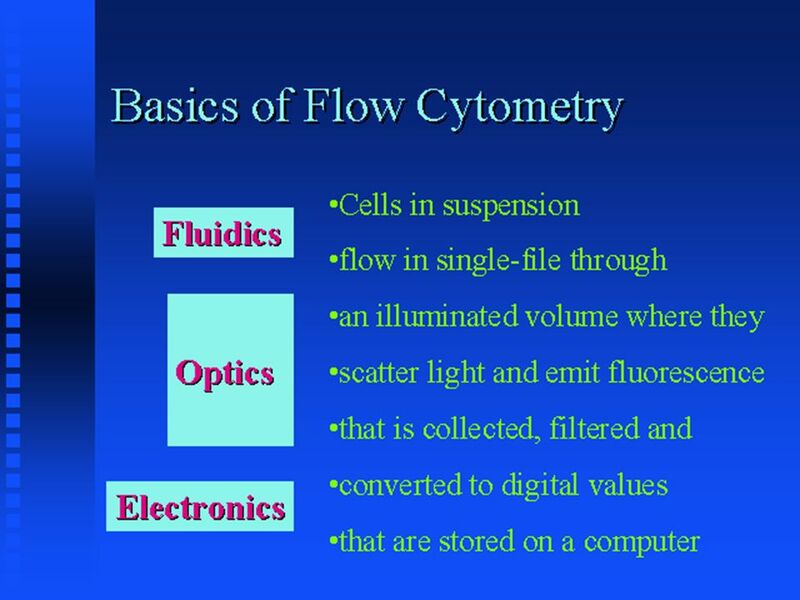 Professor of Pathology and Director, Clinical and Research Flow Cytometry Laboratories. 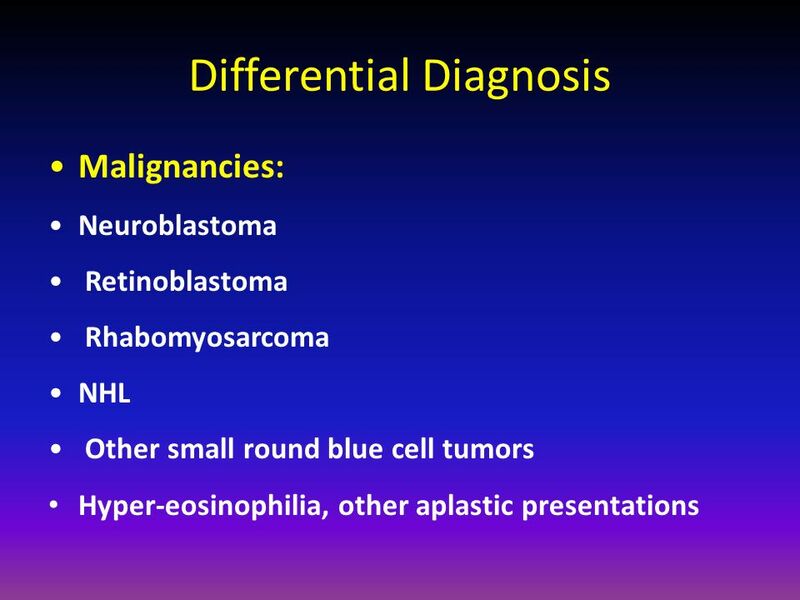 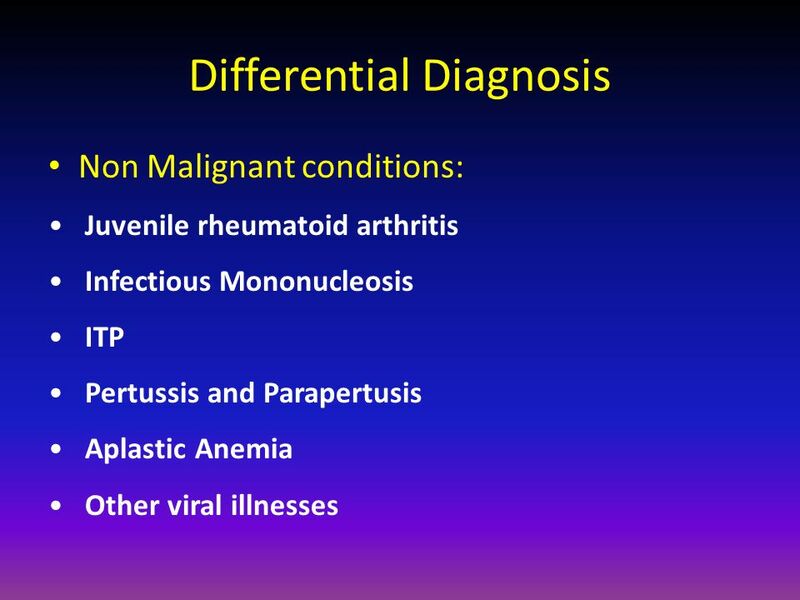 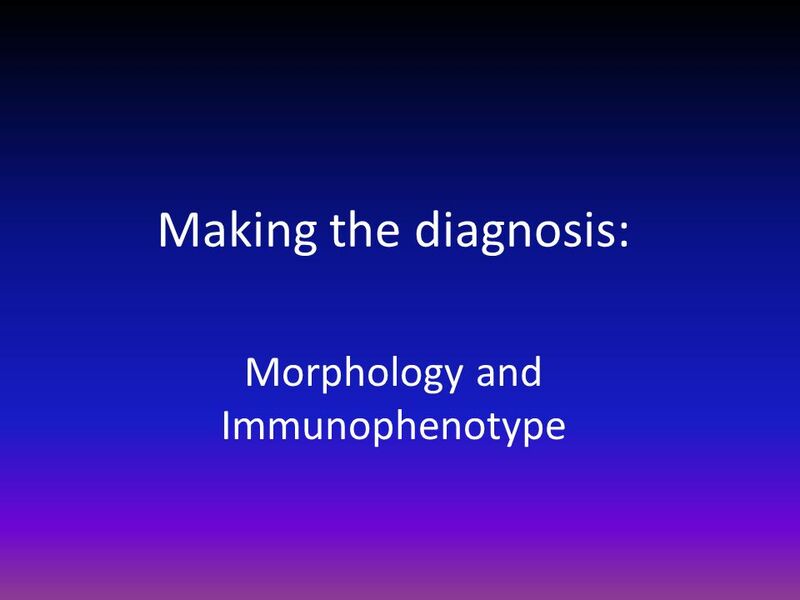 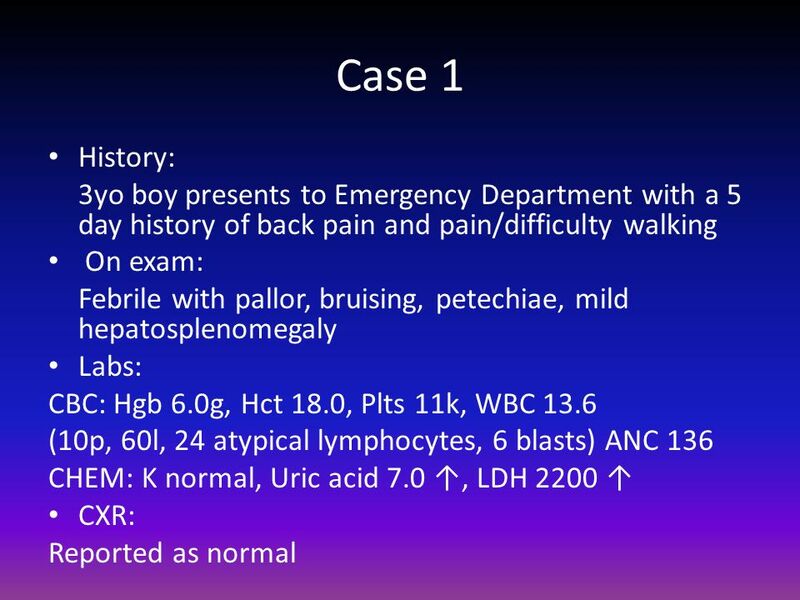 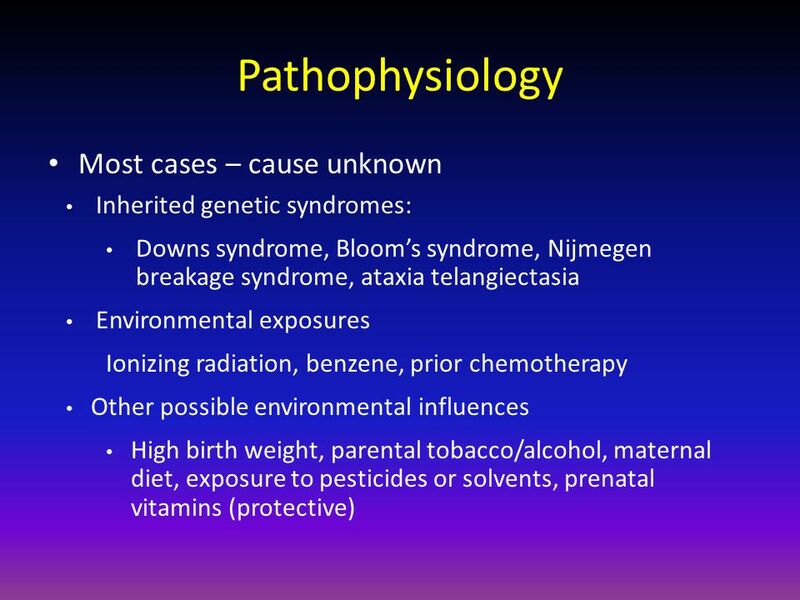 Case 10 New Frontiers in Pathology, 2009 William G. Finn, M.D. 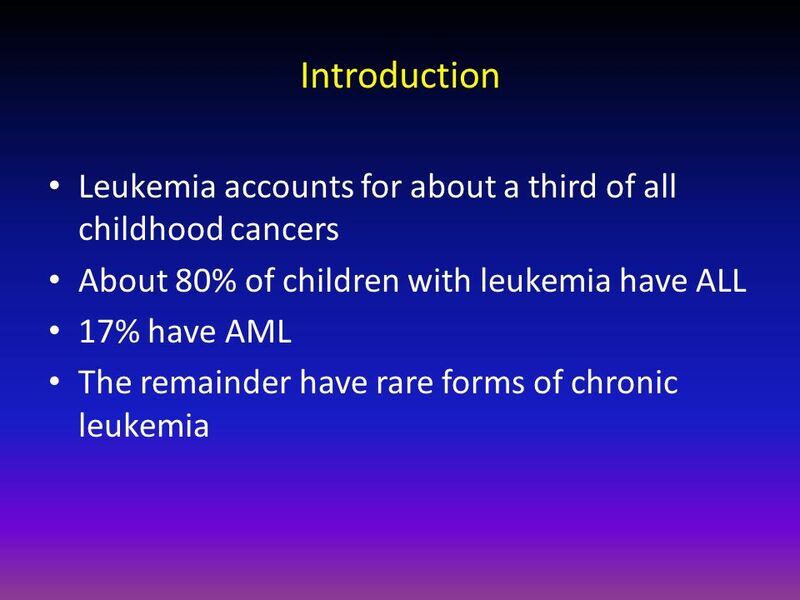 Who, What and When: Transplant for Acute Lymphoblastic Leukemia Brandon Hayes-Lattin September 13, 2013. 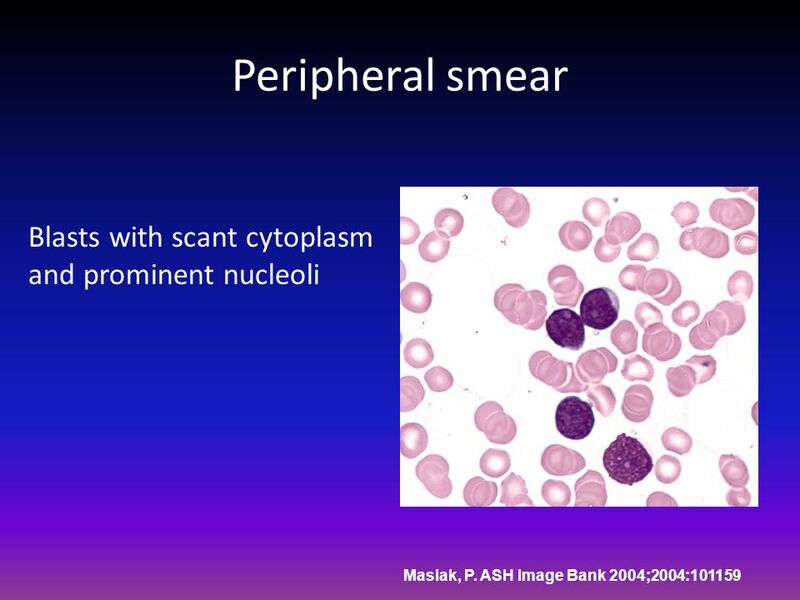 Childhood Cancers: A Review Haruna Baba Jibril MB,BS; FCMPaed; MSc (Haem) Department of Pediatrics Princess Marina Hospital. 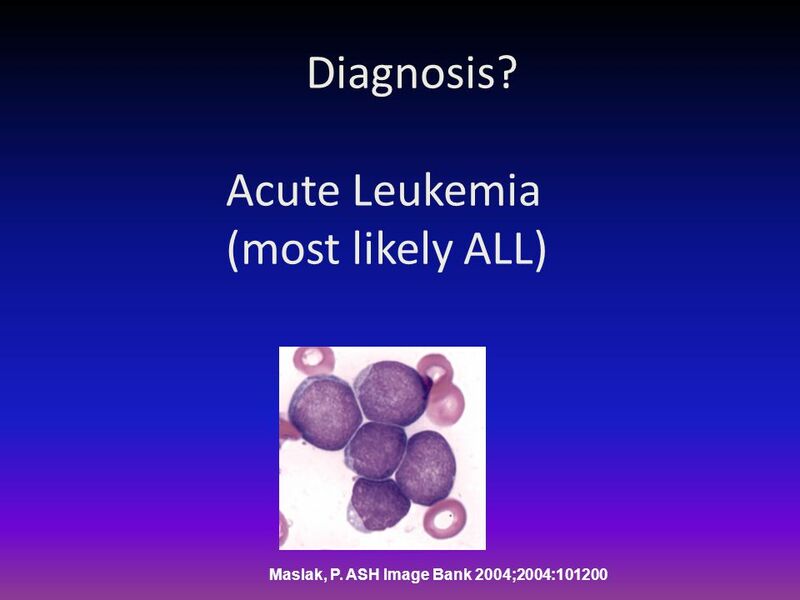 Acute Leukemia Rakesh Biswas MD, Professor, Department of Medicine, People's College of Medical Sciences, Bhanpur, Bhopal, India. 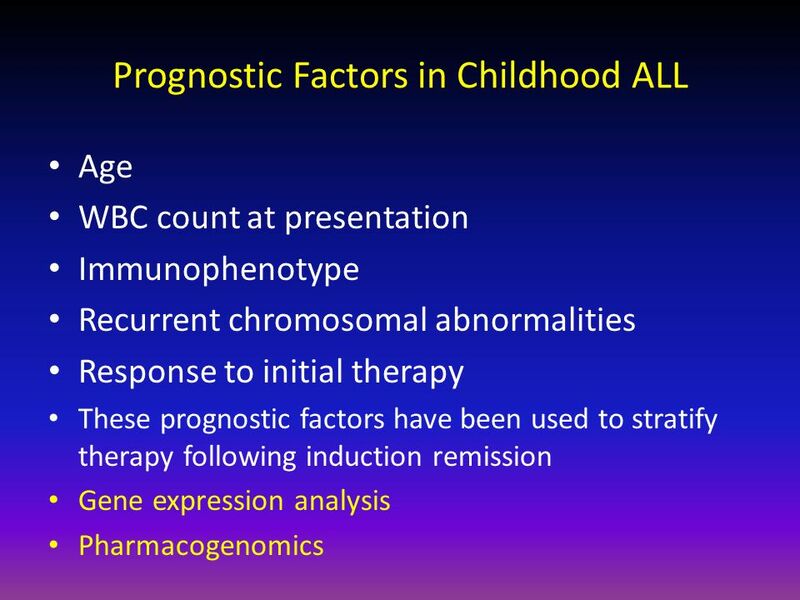 TA OGUNLESI (FWACP)1 CHILDHOOD LEUKAEMIA. 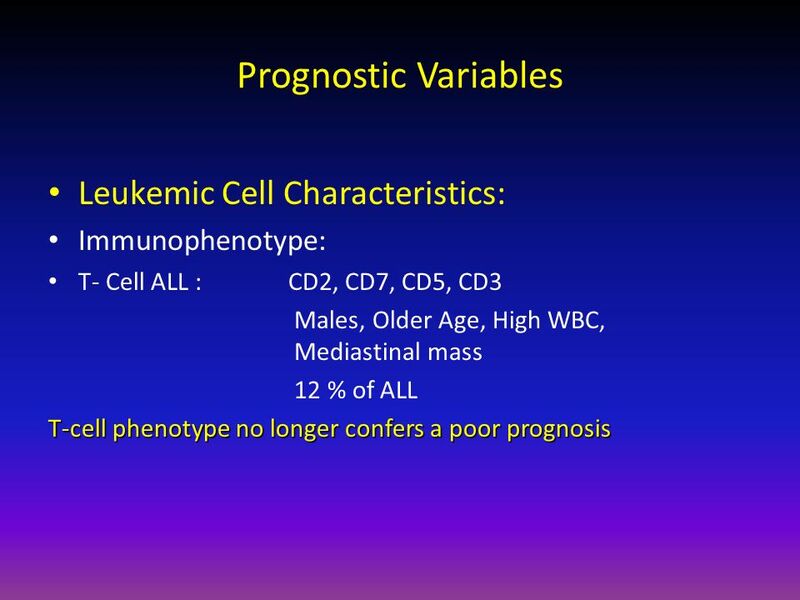 TA OGUNLESI (FWACP)2 LEUKAEMIA Heterogenous group of malignant disorders Characterised by uncontrolled clonal. 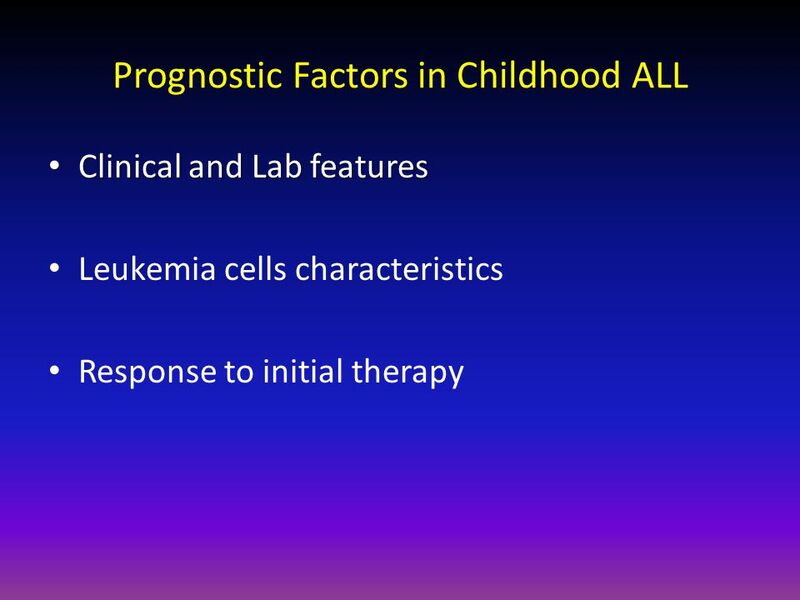 Childhood Leukaemia Aengus S. O’Marcaigh, M.D., F.R.C.P.I., F.A.A.P. 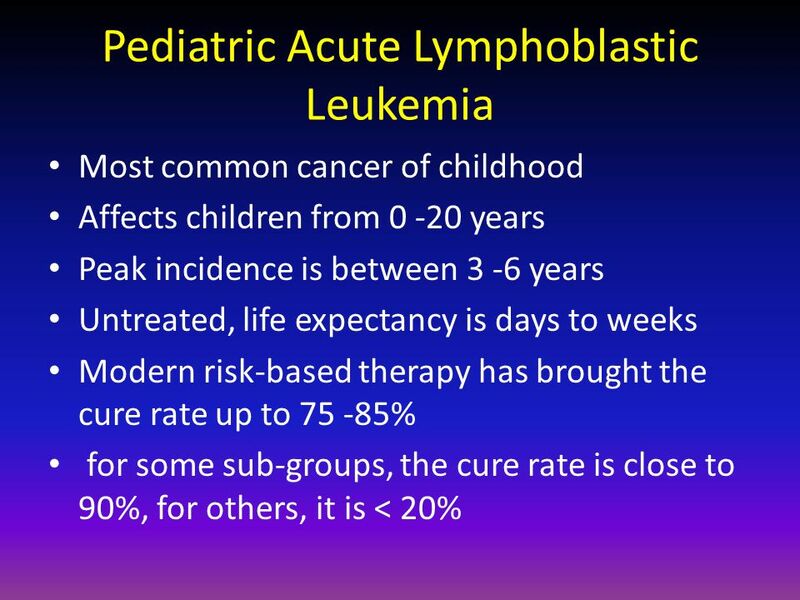 Department of Paediatric Haematology &Oncology Our Lady’s Hospital for Sick Children. 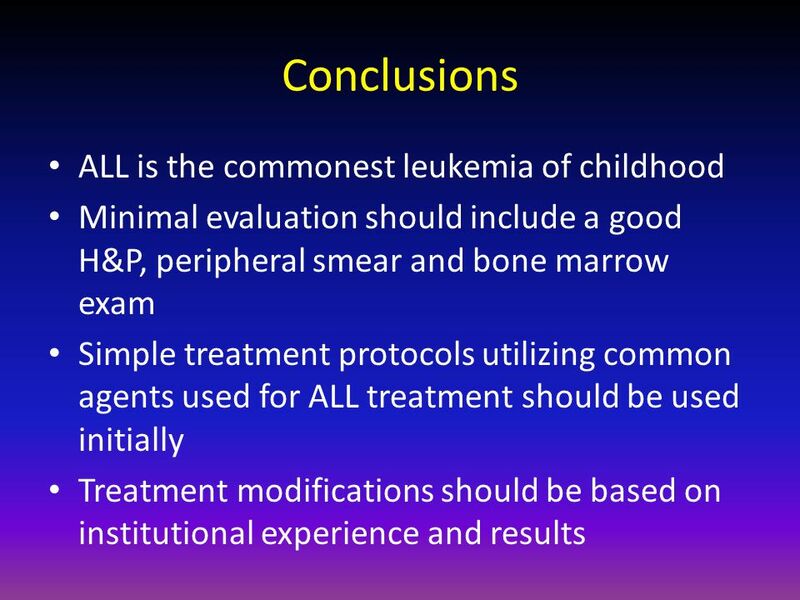 Childhood Acute Lymphoblastic Leukemia Kelsey Shaffer CHTN Staff Meeting Presentation. 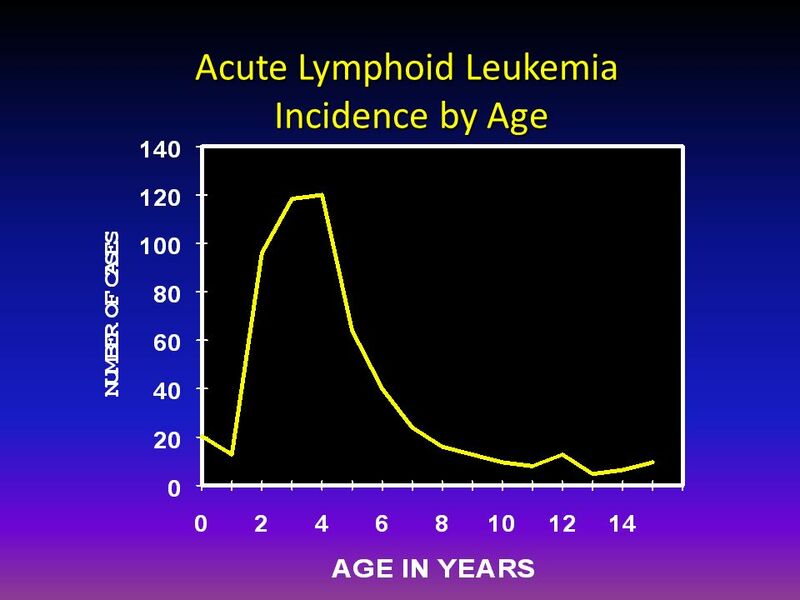 Acute Lymphoblastic Leukemia Maggie Davis Hovda 5/26/2009.